Geelong Cricket Club will this weekend attempt to win its maiden Premier Cricket First XI premiership when it takes on Carlton at the Junction Oval in a three-day game beginning this Friday. The Cats won their way through to the decider with a dominant win over Fitzroy Doncaster at home last weekend. Batting first, Mitch Reid (166) and Eamonn Vines (116) got the side off to the perfect start with a record breaking stand of 287 for the first wicket. Hayden Butterworth (35) and Tom Jackson (31) chipped in to see the side finish on 8/421 declared. It was then the bowlers’ turn to go to work, which they did in fine fashion. The visitors did put up some resistance early on with a couple of decent partnerships but Brody Couch (5/44) and Brenton McDonald (3/70) turned the screws to bowl them out for just 240 and progress to the big dance. This grand final will be a huge game for the Cats. They have the side to do it, with a fantastic spread of even contributors all standing up at various times throughout the season. With a strong showing, and maybe a little sprinkling of luck, the boys from Kardinia Park will hopefully bring the premiership cup back down the highway for the first time on Sunday evening. 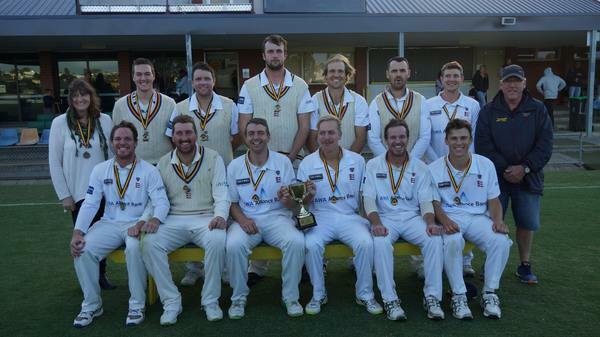 In Geelong Cricket Association, the grand finals have been run and won. As has been Mother Nature’s want over recent years, plenty of bad weather blighted the last weekend of the season, which only added to the drama and intrigue of a gripping finale to the season. In division one, East Belmont carried the weight of expectations through to take home the cup, which had seemed the club’s own for the taking for most of the season. Batting first, Sean O’Neill (10) fell early but not before bringing up his 1000th run for the season, the first time this has been achieved in Geelong Cricket Associations history. The Lions depth shone through, though, as Hayden McMahon (71) and Matt Lineker (58) combined for a 91-run stand. With weather causing many interruptions, the Lions’ innings was eventually forced to close early, meaning they could only post 214 from 74 overs. This gave Grovedale a sneaky chance, and despite losing Tobias Hogg (2) early, the Tigers looked to be going okay at 1/36. The introduction of Alex Willerton (4/7) to the attack completely changed the game, though, with the big quick producing a fearsome spell of fast bowling to tear through the Tigers’ middle order to leave Grovedale reeling at 6/45. Gareth Yelland (45*) offered some resistance but the damage was done, Grovedale all out for just 103 as East Belmont walked away with its ninth First XI premiership and second in a row. In division two, as predicted, an upset saw Marshall take home the cup with a clinical disposal of Torquay. The Bears batted first on Saturday and posted a very competitive 181, man of the match Jake Hilton (66) top scoring as Kal Dubbledam (60) added a late flurry to boost the total. In reply on Sunday, Torquay looked to have the run chase under control when it reached 1/46 but skipper Corey Walter (5/28) and Brad Greenwood (5/45) turned the game on its head with some quality pressure bowling to lead the Bears to a magnificent 76-run win. And in division three, Modewarre won its maiden turf premiership with a dominant victory over Bannockburn. The Bulls batted first on Saturday, with Connor Jervies (27) top-scoring in a low total of 143. Aaron Hovey (4/44) and Mitch McDonald (3/42) were the pick of the bowlers. In reply, Jan Nowicki medallist Jake Hooson (58) top-scored as Modewarre cruised to a comfortable seven-wicket win.